Only 11 days to Christmas, my daughter does religiously updates her wish list to Santa everyday so that he won’t forget to bring what she needs. My holiday baking has started still some cookies and bread in my do list. Every year I make gingerbread cookies and cookies from various countries. This year for a change I decide to make these spicy granola gingerbread cookies. As I need to try Quaker® Simply Granola. I made this cookie using granola and is also inspired from the Russian Christmas cookies Pryaniki. I will say this recipe has both characteristic of gingerbread cookies as well as pryaniki. Adding granola with honey and almond gave a crunch to this soft cookie. Do you Quaker® Simply Granola is tasty and filling with hearty, satisfyingly crunchy granola clusters and delicious inclusions like real fruit and nuts and also very low in sodium. 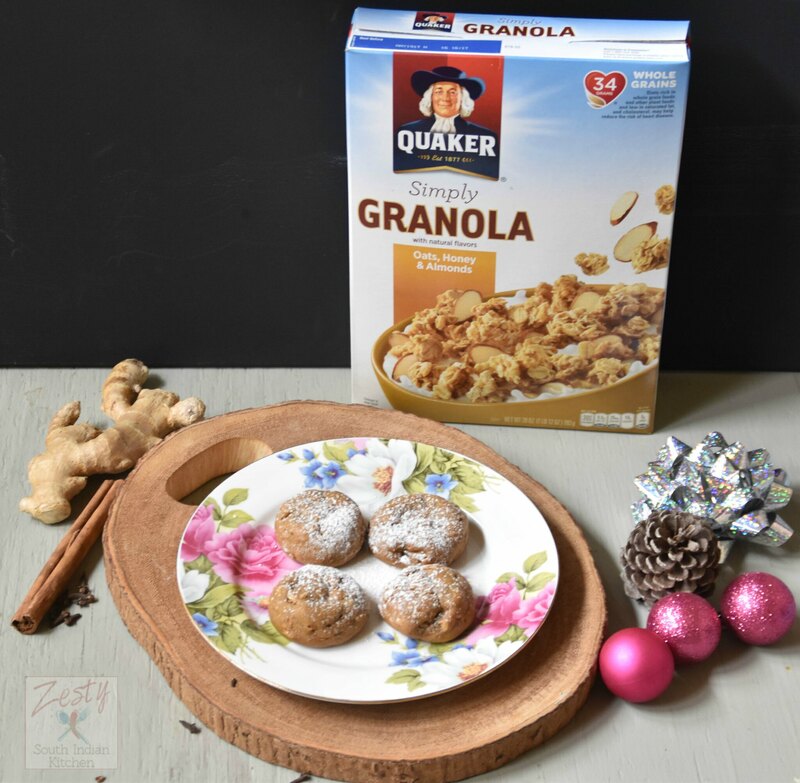 You can make holiday cookies, bread with this Quaker® Simply Granola. Also they are comes in new box just like rest of cereal. You can find Quaker® Simply Granola Oats, Honey & Almonds. Quaker® Simply Granola Oats, Honey Raisin & Almonds and Quaker® Simply Granola Oats,, Apples, Cranberries & Almonds in local Wal-Mart grocery store. Holidays for me always come with exotic spices like ginger, cardamom, cinnamon, nutmeg, cloves etc. Yes love to bake with this spices not only they make baked goodies tasty but also makes the house aromatic while they baking in the oven. I used molasses, honey and spices and Quaker® Simply Granola Oats, Honey & Almonds, orange zest to make this cookie. This is a chewy cookie with crunch from the granola and almond. While cookies warm I dust them with powdered sugar. If you want you can make sugar glaze and dip the cookies to make it look like pryaniki. Make sure to watch out of oven while baking the cookies otherwise there is chance of burning the bottom part. These are soft cookies with little crunch, goes well with a cup of coffee or tea. If you planning to keep it for Santa then keep a glass of milk too just like my daughter told me. 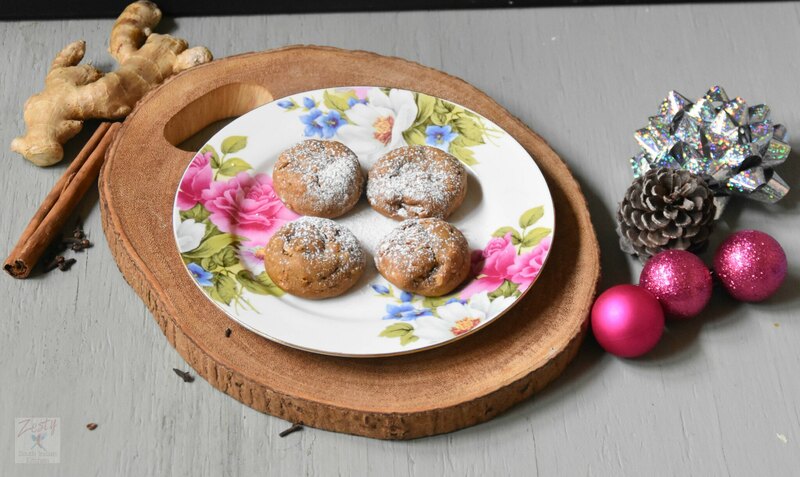 Instead of making regular gingerbread cookies for these holidays bake this you won’t miss any gingerbread taste here only going to find an extra crunch. 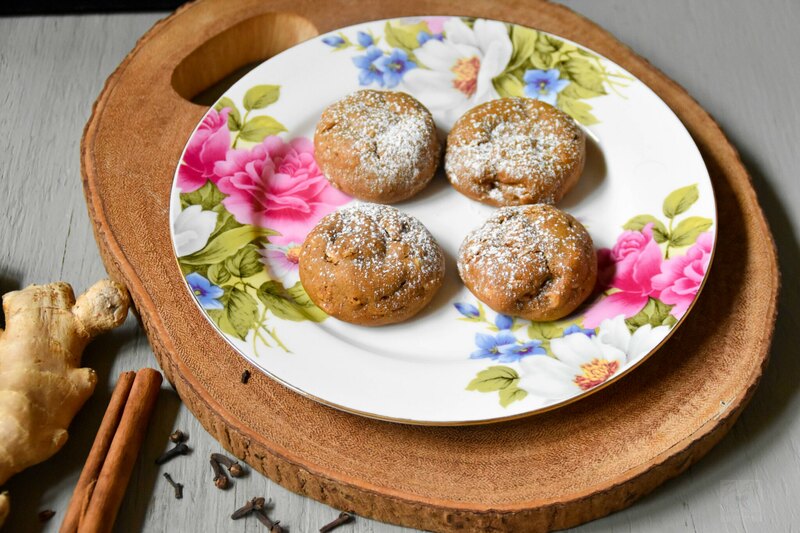 Delicious spicy gingerbread cookies with spices like, cardamom, cloves, ginger, cinnamon, nutmeg. In medium bowl add flour, baking soda, cinnamon, ginger, cloves, cardamom and nutmeg and mix well and set aside. molasses, honey, egg, zest of orange, grated ginger and mix well. and mix well to this add granola and fold in well. Then set aside refrigerator for 30 minutes. Place 1 tablespoon cookie dough at 2 inch apart and bake it for 10 minutes or until the bottom gets slightly brown. Let leave the cookies in the baking sheet for 1 minute. Then transfer to cooling rack and cool completely. You can dust the cookies with powdered sugar as I did. Or you can make a glaze ( 1 cup of confectioner’s sugar and 1-2 tablespoon milk) and dip them to get coated well. Make sure to store with parchment paper in between if you glazed them. Otherwise just store it in air-tight container. 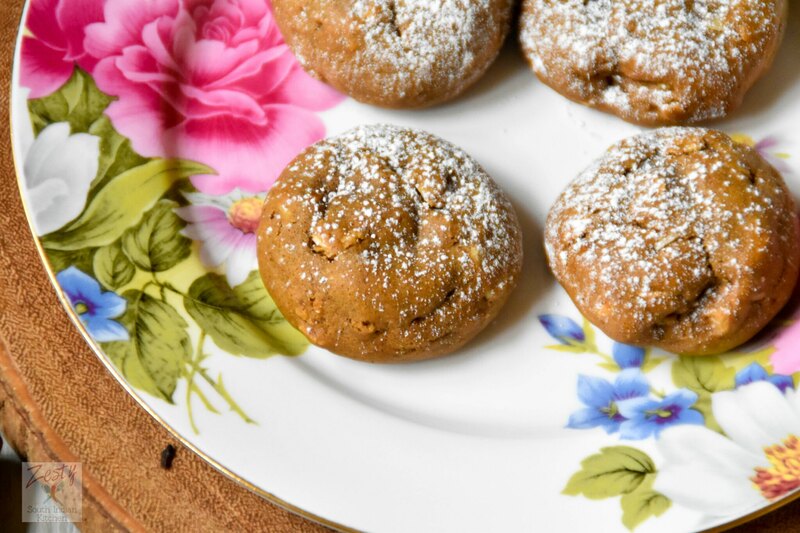 Your Spicy Granola Gingerbread Cookies look and sound so yummy, Swathi! Pinning and tweeting! I’ll bet that the zest from the orange really adds a nice spin these granola gingerbread cookies. They are just lovely. How yummy do these look?!! Soft & chewy cookies are my favorite! 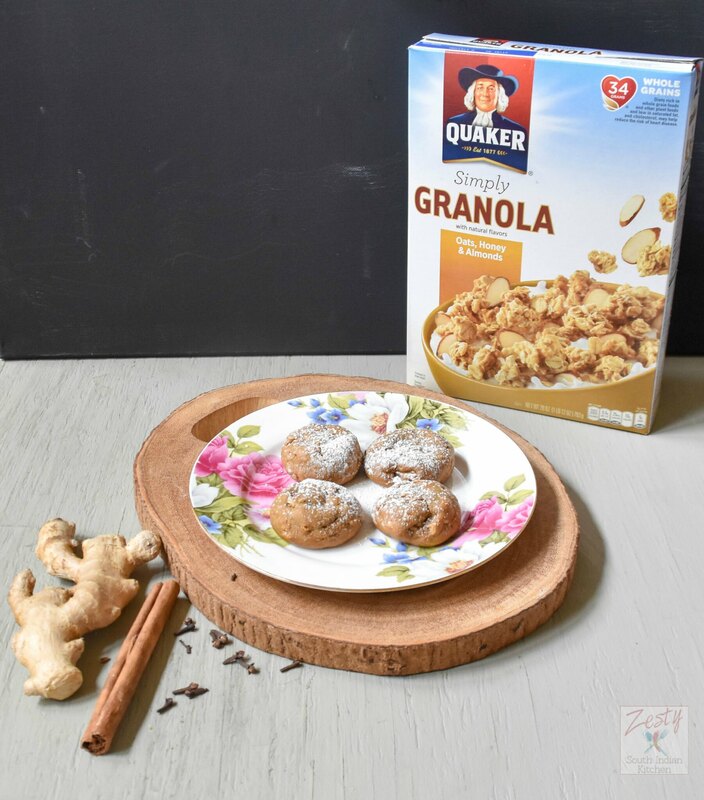 I’m a huge granola fan and I love that you used it in your cookies! I’m also a big of of gingerbread so I bet I would LOVE these cookies! YUM!, Swathi! Pinning and tweeting!